The decision by the United States and a growing number of other countries to recognize a little-known opposition figure as interim president of Venezuela has cast a spotlight on the failing petrostate’s chief foreign backers. Without the continued support of Russia, China, and Cuba, it is unlikely President Nicolas Maduro’s government will last for long. Political. Venezuela remains a strategic political foothold for Russia as it seeks to offset U.S. influence in Latin America and elsewhere. Russia is one of five permanent, veto-wielding members of the UN Security Council, and it has threatened to block any council resolutions to suspend Venezuela from the United Nations. The Kremlin has condemned the Trump administration’s recognition of opposition leader Juan Guaido and warned the United States and its allies against a military intervention. Military. Russia is Venezuela’s largest supplier of weapons, having sold the country more than $10 billion in hardware since the mid-2000s, including assault rifles, jet fighters, tanks, and missile systems. The two nations also conduct joint military exercises, and Russian jets and warships make regular stopovers. In a recent show of force, two Russian bombers capable of carrying nuclear weapons visited Venezuela. Economic. Russia has been a lender of last resort. In late 2017, Moscow bailed Venezuela out by restructuring more than $3 billion in sovereign debt, which allowed the Maduro government to meet its obligations to other creditors. Meanwhile, Russia’s state-backed oil giant, Rosneft, is one of Venezuela’s largest foreign backers, loaning it roughly $2.5 billion in recent years in exchange for future energy shipments. Rosneft also co-owns several oil and gas projects with PDVSA, Venezuela’s state energy company—which was just sanctioned by the United States—and it has a 49 percent stake in Citgo, PDVSA’s U.S. refining arm. Economic. China has been Venezuela’s other major financial crutch. It views the socialist regime in Venezuela as a geopolitical ally and an important trading partner. Over the past decade, Beijing has lent Caracas some $70 billion, mostly for development projects, in exchange for future oil shipments. Analysts estimate the Maduro regime owes China about $13 billion. China is behind only the United States and India as an importer of Venezuelan crude. However, President Xi Jinping has thus far refused to restructure Venezuela’s outstanding loans, and some experts suggest China could shift its support to Guaido if he were to guarantee full repayment of Chinese loans. Political. While Beijing has continued its support for Maduro in recent years, its loyalty largely depends on Caracas’s capacity to pay its debts. 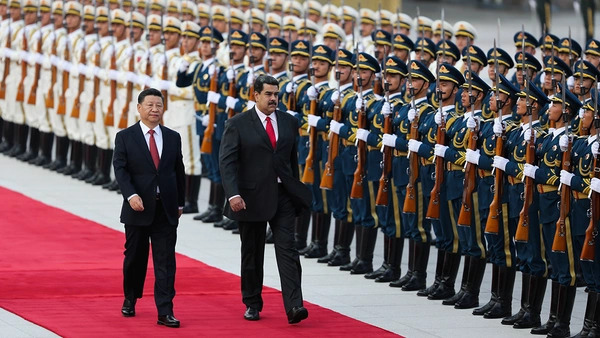 In recent years, China has grown increasingly wary of Venezuela defaulting on its payments, and it has opened communication channels with the opposition. Even so, China—which, like Russia, has a permanent seat on the Security Council—objects to UN intervention in Venezuela’s political affairs. Security. The island nation is Venezuela’s main political supporter in Latin America, and it reportedly supplies the Maduro regime with large numbers of security and military advisors to spy on the military ranks, as well as to provide other intelligence. Economic. Cuba has been providing Venezuela with hundreds of doctors, nurses, teachers, engineers, and other professionals since 2000, when Chavez agreed to supply Cuba with discounted oil. In 2017, there were as many as fifteen thousand Cubans living in Venezuela. Maduro’s allies have enabled him to maintain his grip on power despite years of domestic unrest and growing international pressure to step down. Decisions by Russia, China, and, to a lesser extent, Cuba to withdraw their support could prove the Maduro regime’s undoing. On the other hand, increasing their assistance could extend Maduro’s reign. Ultimately, what comes next rests on the strength of Maduro’s alliances.